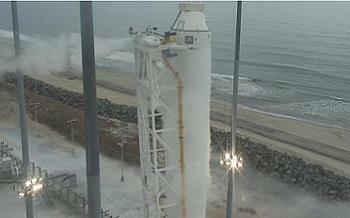 Orbital’s Antares vehicle has enjoyed a successful hot fire test on Friday. The success followed last week’s scrubbed attempt at at T-1.5 seconds – related to a low pressure purge condition ahead of engine ignition. With the issue resolved, the Antares came to life for the first time, firing its engines for 27 seconds. Orbital’s new launch vehicle is making progress towards its debut launch, ahead of carrying the company’s Cygnus spacecraft on a demonstration run to the International Space Station (ISS) later this year. The duo make up half of NASA’s multi-billion dollar Commercial Resupply Services (CRS) contract, awarded to Orbital and SpaceX at the end of 2008. Cygnus has been tasked with eight supply runs to the orbital outpost, while SpaceX will soon carry out the second of 12 cargo missions when they launch SpX-2 (CRS-2) on March 1. 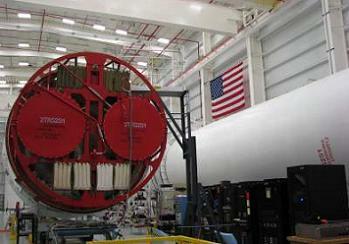 The Antares – a vehicle that started life under the Taurus II call sign – is the first cryogenically powered rocket produced by Orbital Sciences, as well as its largest rocket to date. 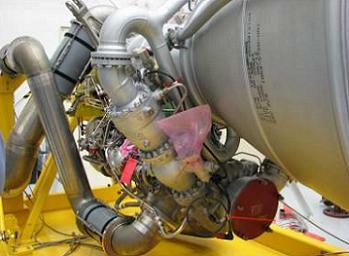 The main engine for the first stage of the Antares is the Aerojet produced AJ-26. These engines are a rebuilt version of Soviet NK-33, originally intended for the massive N-1 launch vehicle that was in direct competition with NASA’s Saturn V.
Aerojet later bought the engines – which had never been used – and added modern electronics and other performance enhancements. Orbital, Aerojet and NASA have already completed a series of successful hot fire tests of an Antares AJ26 engine at NASA’s Stennis Space Center. However, Wednesday’s hot fire was to be the first time the AJ-26s were tasked with firing up as part of the integrated Antares vehicle. In preparation for the hot fire, Orbital recently completed an extensive series of cold flow propellant tests – also known as wet dress rehearsals – at the Mid-Atlantic Regional Spaceport (MARS) launch complex at NASA’s Wallops Flight Facility. The tests were performed to confirm that the launch complex’s propellant handling systems were performing according to specifications and were fully compatible with the liquid fuel first stage of the Antares rocket. The successful conclusion to the cold flow testing allowed Orbital to move towards the hot fire operation – a test that would result in the two AJ-26’s generating a combined total thrust of 680,000 lbs during a 29 second firing, all while Antares was held down on the pad. 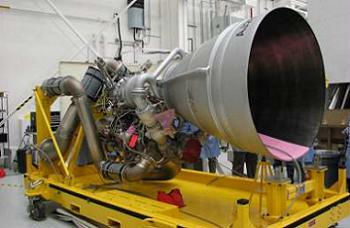 The primary goals of the hot fire test are to ensure that the pad’s fueling systems and the Antares stage one test article function properly in a fully operational environment, that engine ignition and shut down commands operate as designed, and that the two AJ-26 first stage engines perform properly in the dual engine configuration. Per L2’s coverage of the initial hot fire attempt last week, everything proceeded smoothly during the countdown at Wallops, all the way until just prior to engine start. With a gaseous nitrogen (GN2) purge of the engine from ground support equipment required, the flight computer deemed the pressure to be slightly less than the predetermined criteria called for, resulting in the software calling an abort. The abort still gained good data for engineers to evaluate, along with showing the flight computer performed well in monitoring key requirements in the count, a critical requirement. Ahead of Friday’s attempt, engineers replaced valves and seals on the vehicle, along with doubling the torque on the GN2 purge pressure valve’s actuator, rectifying was was deemed to be the only problem during the initial attempt. The issue-free hot fire on Friday proved the mitigation worked as planned. After the engines fired for 29 seconds, engineers will spend three hours detanking the launch vehicle. “Our initial assessment of the test data shows that we were successful in achieving each of the primary objectives we had hoped to accomplish going into the test,” said Mr. Mike Pinkston, Orbital’s Antares Program Manager. Following the data review, the first stage test article will be returned to the Horizontal Integration Facility where the core and two engines will be refurbished for a later flight. Next up will be the debut launch of the flight-ready Antares. “This pad test is an important reminder of how strong and diverse the commercial space industry is in our nation,” added Phil McAlister, director of Commercial Spaceflight Development at NASA Headquarters in Washington. Currently scheduled for March or early April, Antares will be tasked with a test flight mission, lofting a Cygnus mass simulator payload that will be heavily instrumented to gather data on the launch environment aboard the vehicle. In addition, four small “pico satellites” will be deployed from two dispensers that will be integrated with the mass simulator. Providing no major issues were found with the test launch, Orbital will then move on to their final requirement under the Commercial Orbital Transportation Services (COTS) contract – a full demo mission. This mission – known as ORB-D – involves an Antares launch vehicle carrying a fully operational Cygnus spacecraft that will rendezvous and berth with the ISS to demonstrate the full capabilities of the cargo resupply system. (Images: via L2’s Antares and Cygnus Section – containing presentations, videos, images, interactive high level updates and more, with additional images via Orbital).